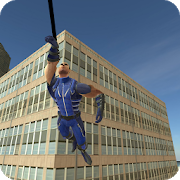 Rope hero charges into the crime city looking for adventures. Glory? Acknowledgement? Who needs it when you can do whatever you want in the town! Bandits and government have prepared their evil nets to trap you. Don’t fall for it. Free action, tons of quests. The only thing you need to guard is your purse! Stop browsing web and try out this superhero masterpiece.